Holly Pester was born in 1982 and grew up in the West Midlands. She studied Art History, then Creative and Critical Writing in London and is now undergoing practice-led doctoral research in Sound and Intermedia Poetry at Birkbeck College. 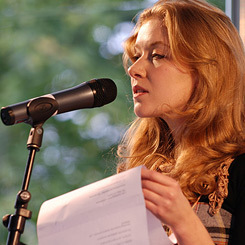 She is an experimental sound poet and writer with an idiosyncratic vocal technique, locating her poetics between poetry, sound and performance. Her live texts are experiments in the sound and shape of speech which play on ideas of radio broadcast, noise, milieu, hailing and transpositions in an ongoing investigation into language transmission. Holly Pester is a live-based poet and regularly performs at art and literary events in the UK including 2009’s Serpentine Gallery Poetry Marathon, 2010 Ledbury Poetry Festival 2010 and the upcoming Text Festival 2011 in Bury. Examples of her work and process, and event news can be found at hollypester.com. Recorded at poet’s mother’s home near Coventry, 09/08/2007. Recorded at poet’s home in North London, 19/10/2010. Part of an ongoing poem that sources the news bulletins of Radio 4’s Today Programme. Recorded at poet’s home in North London, 15/05/2007. Recorded at Archive of the Now studio in North London, 19/10/2010.